MacPhail began his career as a baseball executive with the Chicago Cubs' Rookie-level Minor League Baseball affiliate in 1976. After a year in the role, he became an assistant in the Cubs' parks operations department, and was promoted to assistant director of player development. He joined the front office of the Houston Astros of Major League Baseball as their assistant director of scouting in 1981, and then was promoted to assistant to the general manager in 1982. He was hired as the Minnesota Twins' vice president of player development in 1984, and then as the Twins' general manager in 1985. As the Twins' general manager, he hired Tom Kelly to serve as the team's field manager, and traded for Jeff Reardon, Dan Gladden, Joe Niekro, and Dan Schatzeder. Under MacPhail, the Twins won the 1987 World Series and 1991 World Series championships. The 1991 Twins rebounded from a last place finish after MacPhail signed Jack Morris in the offseason. MacPhail won Sporting News‍ '​ Executive of the Year Award in 1991. 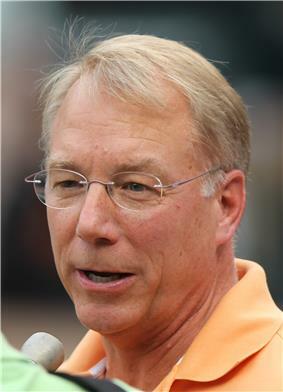 On June 29, 2015, the Philadelphia Phillies hired MacPhail as a special assistant to Pat Gillick, the team's president. MacPhail will succeed Gillick as president after the 2015 season. ^ a b c "Team President Andy Macphail Steps Into The Lineup With A Reputation As Baseball's Best Young Executive". tribunedigital-chicagotribune. Retrieved June 30, 2015. ^ a b "The Times-News - Google News Archive Search". google.com. Retrieved June 30, 2015. ^ a b "MacPhail joins Orioles front office". Baltimore Orioles. Retrieved June 30, 2015. ^ a b c Chicago Tribune (October 11, 2014). "Orioles' success part of Andy MacPhail legacy - Chicago Tribune". chicagotribune.com. Retrieved June 30, 2015. ^ Chicago Tribune (June 16, 2015). "John McDonough's success started on the North Side". chicagotribune.com. Retrieved June 30, 2015. ^ "Andy MacPhail opts not to return to Orioles". tribunedigital-baltimoresun. Retrieved June 30, 2015. ^ Santoliquito, Joseph. "Phillies Hire Andy MacPhail". CBS Local. CBS Local Media. Retrieved June 30, 2015. ^ Goldstein, Richard (November 9, 2012). "Lee MacPhail, Executive Who Led American League, Dies at 95". The New York Times (The New York Times Company). Retrieved June 30, 2015. ^ "Prominent Alumni". Kappa Sigma Fraternity. Kappa Sigma Fraternity. Retrieved June 30, 2015.